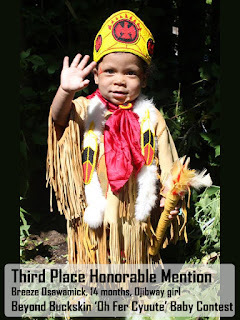 BEYOND BUCKSKIN: Beyond Buckskin Baby Contest Winners! 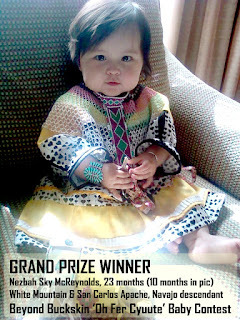 Beyond Buckskin Baby Contest Winners! The results are in! We have the winners for the first-ever Beyond Buckskin Baby Contest. Dubbed the "Oh Fer Cyuute" contest - all of the submissions were absolutely adorable and have brought countless smiles to faces throughout the world. We had 189 submissions, and thousands of votes! Hundreds of comments and hundreds of shares - thank you to everyone who helped make this first contest a great success. Finding a winner from all the amazing image submissions was no easy task and several of you voted for many contestants (I voted for them all!). Click here to see all the beautiful photos of our little ones (aka, The future leaders!). The Grand Prize went to Nezbah Sky McReynolds, a tiny tot hailing from the White Mountain and San Carlos Apache tribes and a Navajo descendant. In her picture she work a itty bitty camp dress - traditional Apache attire (click on her photo above to magnify). With chubby cheeks, calm composure, that soft baby hair, cute lil hands, and precious toes, she clocked in 1,687 total votes (that means 1,687 people voted for her - wow!). Our runner-up was the precious Rosalie Mianskum, a 4-month-old Ojibwe and Cree baby girl. She was pictured sleeping and bundled up in her moss bag and wearing the cutest matching bonnet (I'm a huge sucker for babies in bonnets!). Dozens of people cooed over this sweet picture, and over a thousand people voted for her. 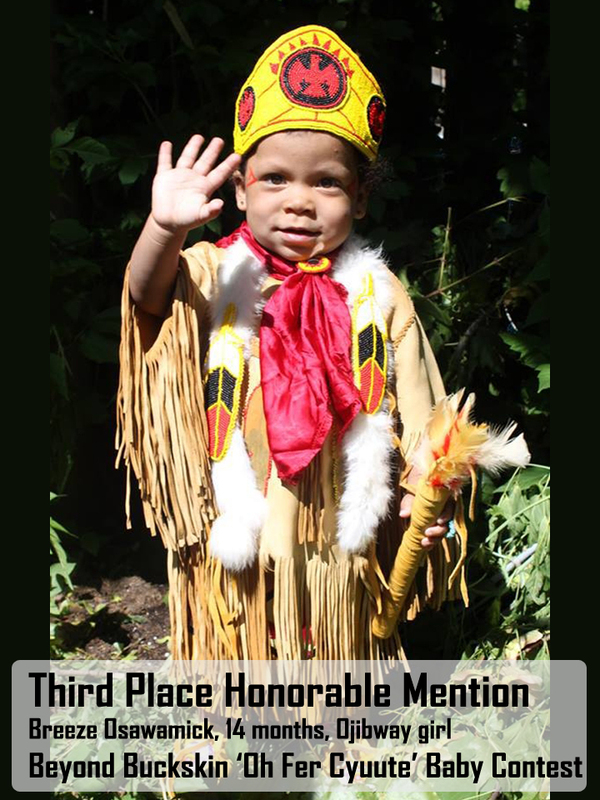 Our third place honorable mention award went to Breeze Osawamick, a 14-month-old Ojibway girl. 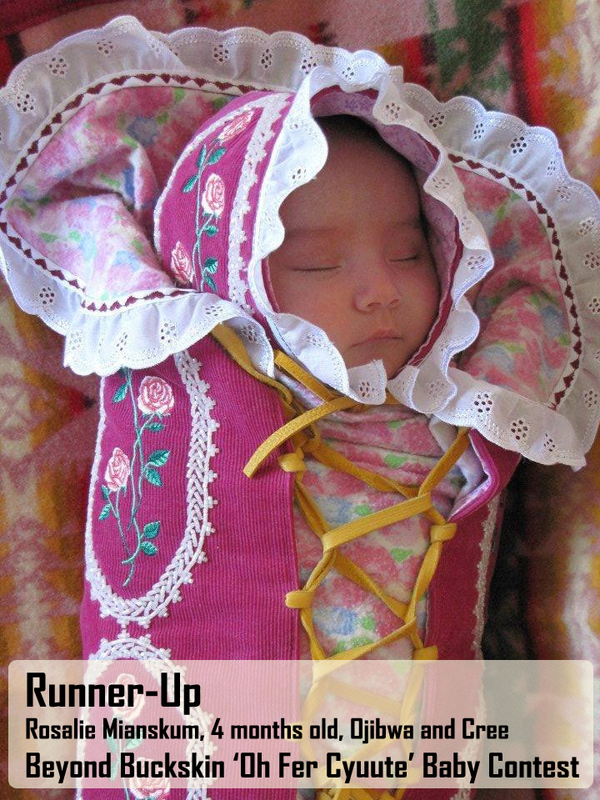 An undeniably beautiful and special little girl, she was pictured in a traditional buckskin fringed dress and over 800 people voted for this little princess. I would like to send a special thank you to all the parents and family members who shared their pictures with us and reminded us of the precious beauty in the world. Click here to see all the photos.